Seats and Upholstery are another area that define the look of the car. Heinkels were economy cars and you’ll realize that after riding a few miles on the original seats. “Basic” is the word that comes to mind. They were originally covered with a plaid fabric facing and vinyl sides and back. As these cars changed hands a number of creative solutions were employed to “improve” the seats by subsequent owners. Bucket seats, black leatherette, zebra stripes to name a few. This is because most of the seat material had worn out. My seats were original but quite ratty. The wool fabric had deteriorated; it looked like it was eaten by moths or mice, and had stains (yuk). While they were still original, they weren't nice, so I decided to renew them. Upholstery was unchartered territory for me. I never had to reupholster a scooter or motorcycle seat. Usually I just bought a new seat cover or sent them out. For these seats though, I wanted to look original and be comfortable. Luckily, my wife is an accomplished quilter, needlepointer, and seamstress. After seeing what I was trying to do she volunteered to help, provided she could learn more about upholstery. 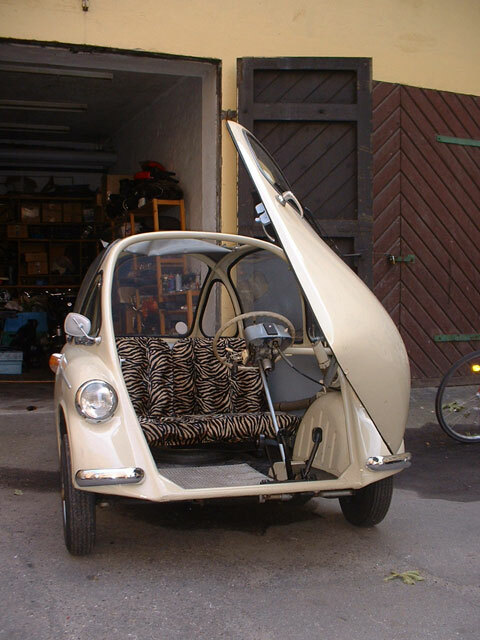 My friend Dan has a BMW 600 (the “limo” of Microcars) and does boat upholstery. I called him and he offered to educate us on how to re-upholster seats, as well as help us get the materials. We were all set! Most of what follows is Dan’s suggestions on how to re-upholster, along with things we learned in the process. The factory seats were composed of a metal frame with springs, followed by a layer of horsehair (or something similar) mat, a thin layer of cotton batting, and then the top covering. There wasn't a lot of padding. We decided we would beef this up a bit, but not so much that it didn't look right. First job was to strip the old covering to get to the frame. I carefully removed the seat covers so I could use them as the basis for a pattern, and saved all the clips that held the fabric to the frame, since it wasn't clear if I’d be able to get new ones. 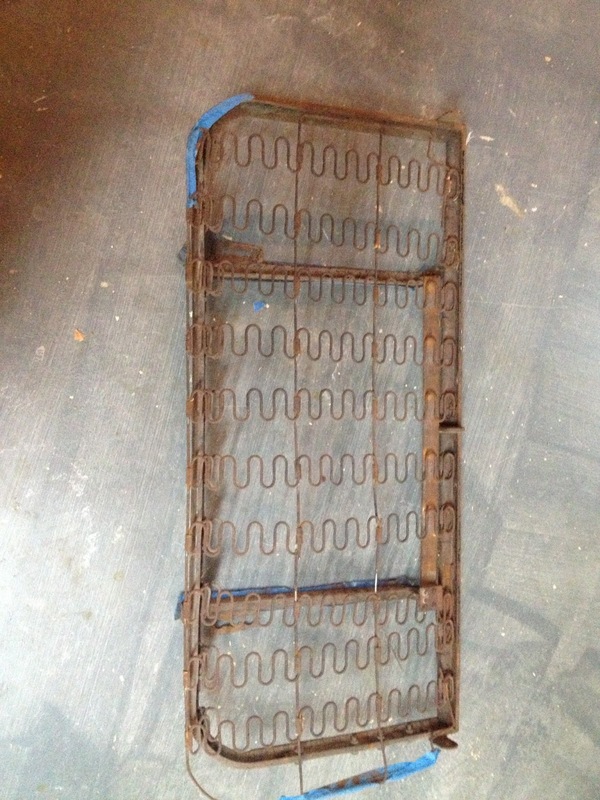 The original seat bottom frame needed some work. On the driver’s side I had to replace some of the cross wires that allowed the springs to work in unison, and some of the springs had been ripped from their anchors on the frame. This seat had seen a lot of action! . The frame was too big to fit in a sand blasting cabinet, so I used old fashioned wire brushes and a power drill to clean it up as best as I could. I popped the seat backs in the blast cabinet and made short work of the paint on those. Then I painted the frame with hammered finish paint, as you can use this over rust, and it provides a durable finish. With the frames out of the way, it was time to rebuild the seats. Dan’s suggested method was a pretty simple: Make a sandwich of foam, batting, and muslin to provide a comfortable surface that can be covered with the final upholstery fabric. Step 1: Use a layer of material to isolate the springs from the padding and fabric so you don’t have any spring parts popping through into the fabric at sometime in the future. I used vinyl-coated tarp. This tarp material is thin like fabric and indestructible. I attached the material to the frame with some of the spring clips that originally held the fabric onto the seat. Step 2: The next step was to purchase foam and cut it to the proper size. I used High Density urethane foam. I purchased 2” thick, 2 feet wide by 10’ long. This was enough foam to do the seat base, seat backs, and the “kinderseat”. I ordered mine from Sears.com at cost of about $60 with shipping. I considered 1” thick, but the 2” is much more comfortable. There’s a hard way and an easy way to cut foam. The hard way is the most obvious method; take a utility knife and repeatedly score it until you've cut it. I don’t recommend this method; foam is not cheap, and it’s not easy to shape the corners.You could use scissors, which work better. I found the best way was to use a band saw. You can get great control and cut to exactly the shape you want. Step 3: On top of the foam we put a layer of ½” synthetic batting. The batting allows you to encapsulate the foam and ease the edges, so you don’t end up with square looking cushions. It also helps keep the fabric and foam in place. At this point we were ready to cut the top fabric- a topic for next time. Is that Heinkel for sale ?